In talking with network managers at schools across the country, one thing is clear: Virtualized networks are the way to go. Here are the biggest benefits. Network admins save time with virtualized servers in Minooka, IL. “I can have a brand new server up and running in about 20 minutes. Setting up a physical server used to take several hours or even a day,” says Jason Willis, network manager at Minooka (IL) Community Consolidated School District 201. “Load balancing is automatic, as VMware moves virtual servers to less busy hardware using VMware’s DRS. If a physical server goes down, VMware will recognize that the physical server has gone down and bring the virtual server back up on different hardware,” says Steve Bradley, network administrator at Rocklin (CA) Unified School District. “Each box has an internal network so we don’t need as big a backbone. Communication happens inside of the server, so it’s faster and easier overall,” says Allen Clasen, director of information systems at Oswego (IL) Community Unit School District 308. 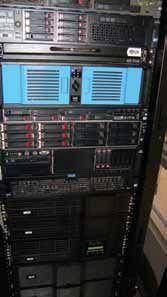 Willis went from more than 20 physical servers to six “host” servers. Bradley went from 100 physical servers to 9 physical blade servers. Today he runs more than 200 virtual servers on 16 physical servers. Clasen went from 60 to 3 standalone servers in each of his two data centers. “Most physical servers use only a fraction of what they have available; with virtualization, we use as much as we can,” says Clasen. “We want to add more technology and capability, but we can’t afford to hire more staff. A virtualized network lets our current amount of staffers do more,” says Smith. Servers nearly manage themselves at Mooresville Graded School District.“There’s less hardware overall, so that’s less hardware to break, to fail, or for us to have to deal with,” says Smith.